Charlie's been burnt one too many times. The Eight of Swords represents Disillusion. This is the card of the cynic, the person who's seen it all and doesn't trust any of it. 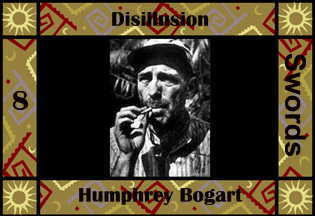 The love of a good woman was usually enough to dispel Bogart's disillusion. Important note: it had to be a good woman. The love of a bad woman only made things worse.